Arthritis is inflammation caused by repetitive cartilage injury and is one of the major causes of joint pain in the human body. Some joints severely affected with arthritis can be definitively be treated with: hip arthritis = total hip replacement or we can fuse (arthrodesis) the joints, ie: great toe arthrodesis. One cause for arthritis is having a fracture that involves a joint. Other causes can be an inflammatory diseases such as lupus. The foot is made up of 26 bones and 33 joints. The largest bone is the calcaneus or heel bone, next is 5 tarsal bones: cuboid, navicular, lateral cuneiform, medial cuneiform and intermediate cuneiform bone. We then have the long bones of the foot which are 5 metatarsals which the toe bones are connected to by ligaments. 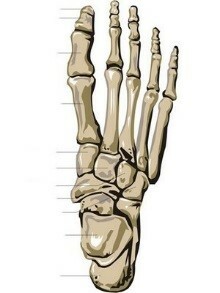 The ‘big’ toe only has 2 bones while the remaining 2nd – 5th toes have 3 each. The precise arrangement of the bones of the foot joint provides us with the flexibility for walking, climbing, running and when arthritis affects these joints it can make the activity much less enjoyable. The most affected joint is the big toe (great toe or first metatarsal joint). 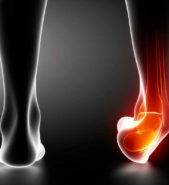 Arthritis can also affect the joints of the mid-foot area, the tarsal bones. A bump on the top of the foot may appear and will be painful when straps or laces from footwear are resting on it. Treatments for this involve either an injection of steroids, surgery or wearing stiffer soled shoes. Surgical intervention may include plate and screws or a ‘pin’ placed in the center canal of the toe. Post op would include wearing a post op shoe for several weeks and be non-weight bearing for a month. If you feel as if you are developing arthritis in the foot & would like to be evaluated please contact us or your primary doctor.